Contrary to popular belief, not all air bags found on motor vehicles are part of the vehicle safety devices and occupant restraint system. In fact, many of the modern SUVS have been built with air bag suspension systems. These air bag suspension systems have replaced the steel coil springs located on each corner of the car. The purpose of the air suspension system is to provide the vehicle and its passengers with a consistently smooth ride. The air suspension products from manufacturers such as Land Rover, Audi, Volkswagen, Porsche and Lexus feature height adjustable suspension which is controlled by the driver. This makes the ride easier on rough terrain and when clearing bumps. This BMW X5 came in with the complaint of a loud noise from under the vehicle. This noise was diagnosed as the air bag suspension compressor pump. 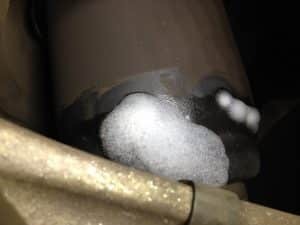 Further investigations by our technicians revealed that the air bags were leaking air, forcing the air compressor pump to work excessively to keep up, resulting in its overheating. One of the causes of these punctures in the air bag suspension is road debris. Finding a very small hole in this area can be a real challenge. With a lot of experience and some good old-fashioned know-how, our technicians were able to isolate the problem and confirm the fault. These suspension air bags cannot be repaired and need to be replaced when damaged. PrevPreviousWater and ECUs Don’t Mix!